This series of posts has been inspired by one of my favorite bloggers– Jennifer from Playgroups are No Place For Children. If you haven’t read her Smackdown posts, hurry on over! Sometimes when I have an issue with a loved one, I let the internet decide who’s right and who’s wrong. Because it’s more interesting than flipping a coin. Here are some topics that we tackled so far! Marinka v. Mama: should the cat water bowl be washed with soap or not? OMG. This post disappeared from my archives. Maybe it is being washed?! Mystery. Marinka v. Husbandrinka should you wash avocados and other sliceable foods and tops of cans or not? Marinka v. Insane People How To Eat A KitKat? Ananomarinka vs. Western Society: Should women shave in the winter? Marinka vs. Annie Double contractions: Yay or Nay? 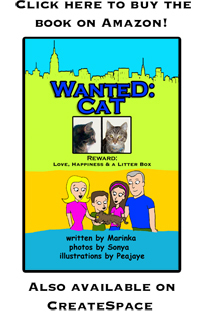 Marinka vs. Marinka’s Daughter Does indoor cat Nicki need an annual check up? Marinka vs. Young Ladrinka: What Does Empty The Dishwasher on Wednesday Mean to You? Marinka vs. Teresa Strasser: Do Some Pregnant Women Really Not Care About The Gender of Their Fetus? Marinka vs. Friend: Would You Like an Orange Slice? Marinka vs. A Family Friend: Should Mis-spelling Words Like Thru and Lite Be Acceptable? America v. Russia: What is the Proper Response to How Are You? Marinka vs. Husbandrinka: Who Had The Better Subway Ride? Marinka v. Husbandrinka: When passing people seated in the theatre, do you face them or not?